St Petersburg was the stage of the EuBea 2016 award ceremony. Currently in its 11th year, the event is now the key European showcase for the event and live communication industries. With its Alfa Romeo and Fiat brands, the FCA group was a leading participant, winning four out of 14 categories of the EuBea 2016 International Festival, and also – among all automotive groups – FCA obtained a podium finish in the Best Corporate Client classification. Organised by ADC Group, the competition rewards a shortlist of best projects selected by a jury of representatives of businesses and associations from the European event industry. In the current 2016 edition, the Alfa Romeo brand took first position in the B2B category, and also achieved a podium position in the Product/Service Launch Event category, thanks to the Alfa Romeo Giulia and Giulia Quadrifoglio – The Mechanics of Emotions, the launching event for the sports sedan that embodies the most authentic expression of the Alfa Romeo spirit. More success for Fiat in the Casa 500 winter tour, with first prize in the People’s Choice Award, plus a podium finish as best Automotive Brand in the Roadshow and Use of Web and Social Media categories. The Casa 500 winter tour, implemented by the Ideal Communications agency, involved bringing a special 500-style home to five prestigious Italian mountain resorts: Bardonecchia, Gressoney, Abetone, S. Martino di Castrozza and Madonna di Campiglio. 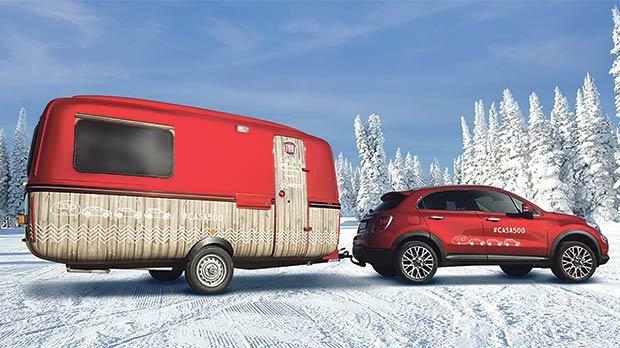 Towed by a flaming red Fiat 500X, the fully accessorised original travelling home offered a unique experience of freedom and light heartedness, right by the ski slope or even on the slopes. Guests of the Casa 500 were also treated to many fun activities, including a chance to test the 500X four-wheel drive. The prestigious awards of the EuBea 2016 event follow those recently awarded at the 13th edition of the Italian BEA – Best Event Awards festival. The Fiat and Alfa Romeo brands dominated that event, with Casa 500 and the two Giulia – the Mechanics of Emotions and We Are Giulietta projects.